This blog was post was originally designed to be a self-service blog post offering the same strategies we employ to remove duplicate business listings for our clients. We strive to keep it updated, but things continuously change with third-party websites including Facebook & Instagram. We have found that many of these tips continue to work today (in 2019), but have also recently discovered that some new versions of unofficial pages exist that are more difficult to remove. We will continue to research and update this page as we find solutions. In November of 2007, Facebook introduced a new set of features designed specifically for improving engagement between local businesses and their followers. Perhaps the most useful of all these new marketing tools was Facebook Pages for businesses. The ability to create business-specific pages made it easier to manage a brand on Facebook. Marketers no longer needed to maintain a separate “profile” for the business that was not connected to their personal account, and they could also create targeted ads on Facebook. 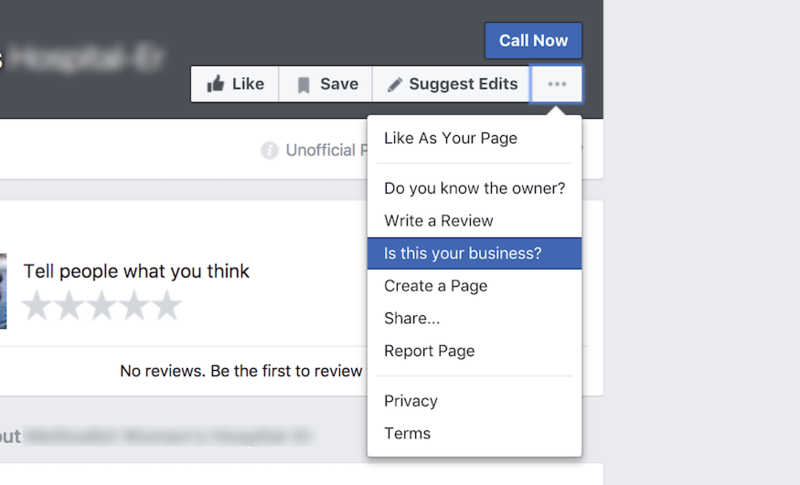 With this rollout, the evolution of Facebook's own local business directory began to take shape—but not without some issues. One of the most frustrating issues for page managers? The existence of unmanaged duplicate pages for your business, known as “unofficial” pages. What Are Unofficial Pages on Facebook? Unofficial pages are unmanaged pages designed to act as a placeholders for locations without managed business pages. The intention here is so users can still check-in or leave reviews and comments for a business that does not have a Facebook presence. If you ask me, these unofficial pages are a prime example of Facebook prioritizing user engagement over user experience. Unfortunately, good intentions alone cannot stop the flow of bad data and spammy reviews (more on this later). Why Does My Business Have An Unofficial Page on Facebook? Unofficial pages are a byproduct of the ever-changing Facebook ecosystem. Remember, users did not have the ability to create and manage a business page on Facebook until 2007. Many of these unofficial pages were likely created prior to the release of Facebook's Pages for businesses. Even in 2017, unofficial pages are still a problem. 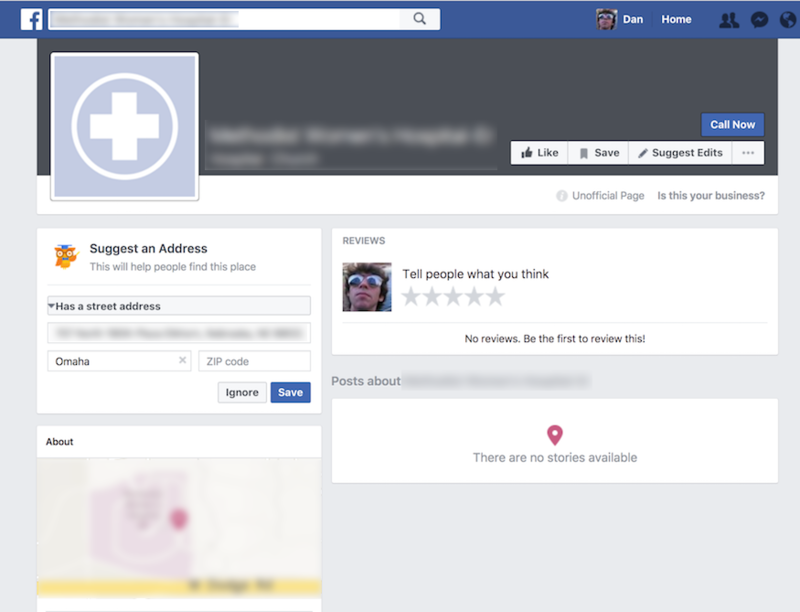 Users can unknowingly create an unofficial page for a business (that already has a presence on Facebook) by submitting incorrect location data. Just like on Google or any other directory, submitting variations of the existing location data for a business on Facebook's directory creates new listings. As far as I can tell, Facebook provides no warnings or notifications to users or page managers when this happens. Most business owners have no idea that one or more duplicate pages exists, and even fewer pursue the process required to claim, merge and remove them. It is never too late to take care of an unofficial business page on Facebook, and the removal process is pretty straightforward. But first, let’s take a look at why you should do it. Why Claim, Merge, and Remove Unofficial Duplicate Pages? Bad data is a primary source of confusion for customers throughout the discovery stage, particularly when searching for local businesses. Claiming, merging, and removing unofficial duplicate pages on Facebook is a way to combat this confusion on social media and improve your location's overall NAP consistency (name, address, phone number + website). Recall our discussion on NAP consistency and location data management. If there are multiple listings for a single business in a given directory, these can compete for authority and positioning within search results on sites like Facebook and Google. The presence of multiple listings can confuse customers about which is the accurate listing, especially if the location data or contact info is inconsistent or outdated. Unofficial pages can also leave your business open to scrutiny on the platform without any chance to moderate the content. For a business without a managed Facebook page, their unofficial page becomes the only source of information that users can find about the location—ultimately giving up control of your image and ability to do damage control if needed. The best way to ensure your customers find your real page on Facebook (right from the start) is to verify your Facebook business page. Now that you understand why it is so important to monitor the appearance of these duplicates, let's take a look at how to do it. Depending on your situation, there are different ways of accomplishing the same end goal. I have a single Facebook page for my business (not verified), but an unofficial page exists. This is probably the most common situation that page managers find themselves in. Although Facebook rolled out a verification process in 2016, many pages are still not verified. Verify your official Facebook business page with a phone call or by uploading official business documents. This can take up to 24 hours to process, but typically much shorter. 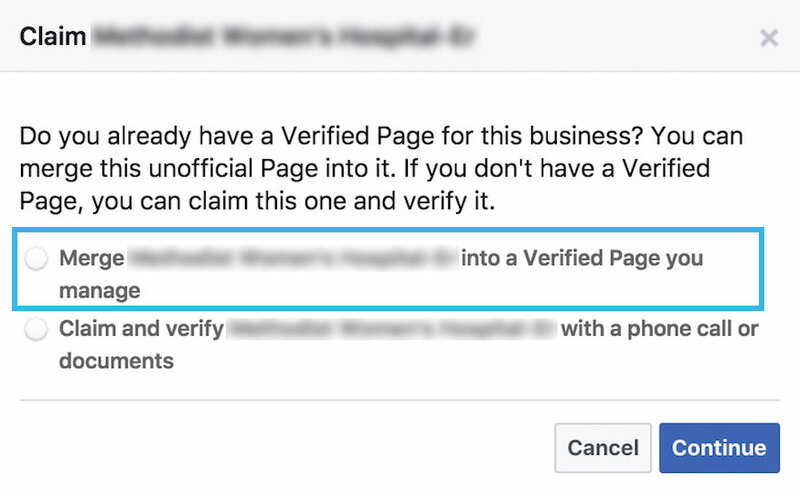 Choose the first option: "Merge into a verified page you manage"
Facebook will decide whether or not your page matches the location of the unofficial page and merge the pages accordingly. Any likes, comments, reviews, and check-ins should be preserved in most cases. I have a single Facebook page for my business (verified), but an unofficial page exists. 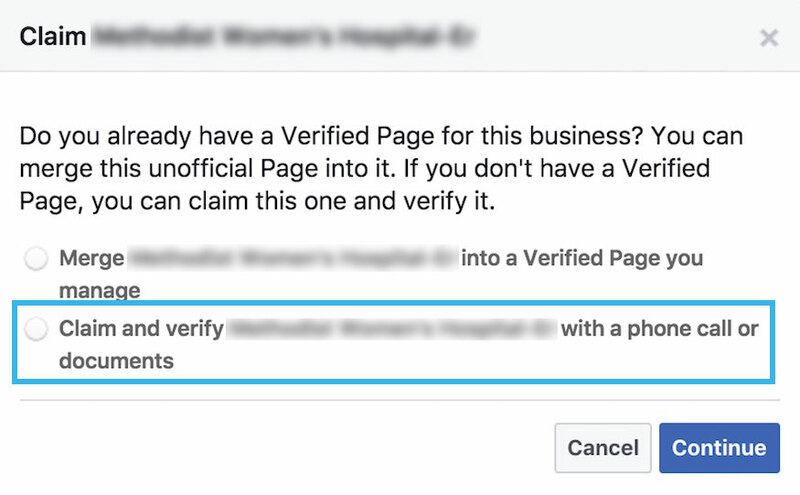 If your business page is already verified on Facebook, great, you are one step ahead from the previous case but the same steps apply. I don't have a Facebook page for my business at all, but an unofficial page exists. If your business is just getting started on Facebook, do a search for your name, address, or phone number to see if you can find any unofficial duplicates that may be lurking in the depths of their directory. Sometimes the location data on these unofficial pages will be incorrect, so be aware. Once you spot the duplicate, you can verify your ownership of the unofficial page and transform it into an official verified page by following the steps below. Choose the second option: "Claim and verify this page with a phone call or documents"
Follow the verification process exactly by answering a phone call or by uploading official business documents. This can take up to 24 hours to process, but typically much shorter. I have two Facebook pages for my business, neither of them are unofficial pages. If you somehow managed to create two Facebook pages for your businesss (but neither of them are unofficial pages), Facebook has a separate process for merging them together. Be sure to read and follow the rules exactly as they are written, as far as I know, there is no way to un-merge a page after this process has been completed. You can only request a merge if you're an admin for both Pages. The Pages you merge must represent the same thing and have similar names. If you try to merge Pages that aren't similar, the Pages may be permanently unpublished. Merging Pages can't be undone once you've started the process. People who like the duplicate Page will be informed of the merge. This may take a few days to complete. Likes and check-ins from both Pages will be combined and shown on the remaining Page. The scenarios above represent the most common cases that we encounter with clients at C3D. Verification provides both Facebook and business owners with the most "official" method for claiming and managing duplicates. If you encounter difficulty with any of the methods mentioned above, there is another way to let Facebook know that you think two pages may be duplicates of each other. Simply navigate to the unofficial page and click "Suggest Edits" to add the URL of the duplicate page in the box below. Just for good measure, I also perform the same action on the official page (if it exists) by adding the URL of the unofficial page as a duplicate.